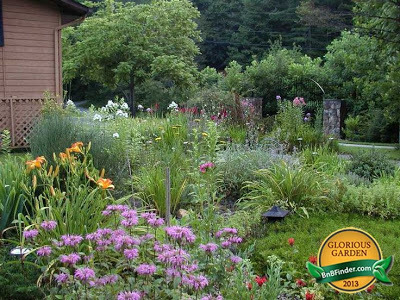 Exciting news to share: Inn on Mill Creek Bed & Breakfast is one of BnBFinder’s 2013 Glorious Garden Award winners! BnBFinder is a worldwide Bed & Breakfast directory, with more than 3,000 B&Bs listed on the site. Plus they include recipes on their site and have a fantastic blog as well. BnBFinder showcases all that’s unique about B&Bs on their Facebook, Twitter, and Pinterest pages. For more photos of what blooms at the Inn on Mill Creek B&B near Asheville, Black Mountain and Old Fort, NC, check out our Flowers at the Inn Pinterest Page. And stay tuned because we have more garden plans for 2014! This entry was posted in Uncategorized and tagged flora and fauna, innkeepers and innpugs, outdoors by Inn on Mill Creek. Bookmark the permalink.